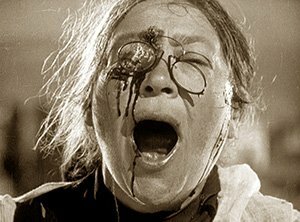 Sergei Eisenstein’s 1925 epic photoplay The Battleship Potemkin not only advanced the nascent silent cinema art, but also served as a successful agitprop vehicle for the Bolsheviks. The opportunity to see its world shattering depiction of maggots, mutiny, and the infamous baby carriage ride down the Odessa Steps on a big screen with a live orchestra comes so rarely that BMInt recommends it enthusiastically to our readers. The Berklee Silent Film Orchestra (BSFO), one of the world’s top silent film ensembles, will bring its award-winning film/concert experience on Thursday, January 18th to the Avon Cinema in Providence, Rhode Island at 7:00 p.m.; on Saturday, January 20th to the Boston Conservatory Theater in Boston at 7:30 p.m.; and on Sunday, January 28th to the Cabot in Beverly, Massachusetts at 6:00 p.m. The 17-piece Berklee Silent Film Orchestra, led by Mirowitz, performs its scores as part of a unique, highly selective set of courses in Berklee’s film scoring program, the first undergraduate film scoring program in the U.S. Two of the ensemble’s scores, The Last Laugh and Varieté, have been released for home video and theatrical exhibition by Kino International to great acclaim. In addition to Potemkin the shows will open with a pair of 1913 short films by pioneering female director and screenwriter Lois Weber, The Rosary and Suspense. BSFO alumnae composers Skylar Nam and Esin Aydingoz have scored both for Kino Lorber’s 2018 video release Pioneers: First Women Filmmakers. Suspense is an historically important film as it may have been the first use of split screen among other pioneering film techniques. The Rosary is a historical melodrama based on a previously—existing song of the same name—the score for this film uses that song’s melody as a thematic element. Both have new scores by recent Berklee film scoring alumnae who have scored previous silent films with the BSFO: Esin Aydingoz (The Rosary) was one of the composers on last year’s The Freshman and Skylar Nam (Suspense) was one of the composers who scored Nosferatu for the show we did with the Boston POPS. Both of them are now composing for media in LA. Do you know that score? Do your students? I understand that the purpose of the Berklee silent program is to train students for modern film scoring careers, so in this case, where a great score already exists, do you expect yours to get broad exposure? Sheldon Mirowitz: We assiduously avoid listening to anyone else’s take on the score. We are trying to have an original take on the film, and are especially focused on delivering the story. A silent film is an incomplete art work – it requires music to become complete. But the music is not a part of the historical document. Instead, the music can and should be used to make the film new again, to reinvent it in meaningful ways for a contemporary audience. Eisenstein himself agreed with that notion—I fact, it was his intent for there to be new scores written as required in this way. It is in this way that we think that our score is an important and valuable contribution to the film and to the audience and to the full artistic experience of the film. We think that our score presents the real essence of the story and the truth of the art intention of the film, and it does so in a language and with techniques that were not yet available to the film when it was shot. This is the way that the silent film can communicate across a hundred-year-gap and have the immediacy that it was intended to have. Can the kids get past the propaganda aspects of the film and see how its most “revolutionary” aspects relate to editing and montage? 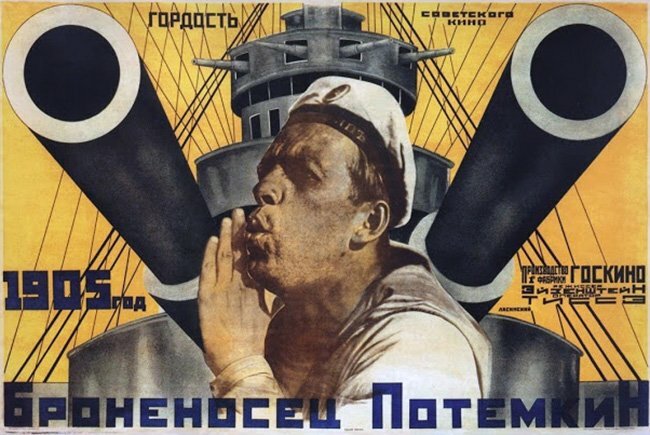 Alison Plante: The propaganda aspect of the film was the hardest part to get across to the students—that and the fact that the propaganda aspect leads to all of the formal structures of the film—the lack of single central characters and heroes who last through the whole movie, for example. Sheldon wrote a “bible” of themes and supervised the composition of the reels, with each composer taking one reel of the film. The goal was to create a single score with a single voice and approach. Do you think silent film music should draw attention to itself and have the chops to stand alone? I think of Prokofiev’s Nevsky Cantata, for instance. This is something which could perhaps be asked of any film score. Our take in the Film Scoring Department is that film music, when done properly, is of the fabric of the film. It’s not that it cannot stand alone, and it requires all the compositional resources of any composition, but its function is not that of concert music which is designed to be a complete artwork, and the form of the film score comes from the film itself. In fact, getting student film composers to understand their role as a member of a collaborative creative team is one of the biggest challenges we have as film scoring educators. Obviously, in a silent film the music is much more prominent, but it still needs first and foremost to serve the story. Will the music be in a style contemporary with the film or something obviously of our own time. I think the style of the score it interacts well with the picture. Is Potemkin going to be presented in a video format? Will the screen at the BoCo Theater be as big as the one at the Cabot in Beverly? Why is the Coolidge not involved this year? It’s a great place to watch old films. We are projecting from Blu Ray’s provided by Kino of the restored films. Since the Boston Conservatory is set up for live theater we have a screen brought in for this performance; it will indeed be similar in size to those at the movie theaters. Our Potemkin score in fact was commissioned by and premiered at the Coolidge Corner Theater, and the Coolidge remains an integral part of all that the BSFO does in the silent film arena. We look forward to returning to the Coolidge this June with our next film commission, which we hope to announce in February. Justin Miller, Reel 1; Michael Oldham, Reel 2; Akhil Gopal, Reel 3; Donny Landers, Reel 4; and Isaac Richardson, Reel 5, wrote the Potemkin score. Of these 5 I have kept in touch with the first 3, who are all still full-time musicians. Justin owns and operates a recording studio in Nashville; Michael is a composer in Chicago; and Akhil is a TV composer in LA. In general, we have seen very positive rates of success in scoring amongst our alums who have taken part in the silent film course. I would urge BMInt readers attend because silent film with music affects us like great opera. Really? Sounds like Mr. Mirowitz doesn’t trust himself or his students. Do we suppose Britten assiduously avoided Mendelssohn when writing his Midsummer Night’s Dream opera, or ditto Walton in writing for the TV production? Sometimes it’s good to know what the other guy did just so you can avoid similarities. Just a quick-ish response. Though I can’t say anything definitive about Britten and Walton, as a working composer who has written hundreds of hours of music, the main issue when writing is how to hear and respond honestly and authentically within the movement of one’s own creativity, and to do so without repeating oneself. That, by the way, is very hard to do. One’s creativity is always reactive, and though it needs to be educated so that it has as much vocabulary and facility as is needed to enunciate itself clearly, powerfully and specifically, it is most valuable when it is real. That, and the problem solving that is an essential part of the creative process – especially for film scoring, which is a lot about problem solving – can be short-circuited if you hear solutions that others have made to the problems that you encounter. Younger composers are newer to the process, and to their own creativity, and are especially (outsized-ly) concerned with whether they are talented, or capable, or legitimate, and are very easily influenced by the process and decisions of those who they see as being obviously all of those things – when what they really need to be is curious, honest, and focused on the thing they are making, and not on themselves. The main thing that we try to do with this project is to educate the students in the act of (film music) creation, which, though obviously served by looking at the work of others (we do that as well! ), is MOST served by actually doing the job of creating the film music itself. And that job involves coming up with ideas, building and connecting them and letting them expand themselves, engaging with a story, presenting the work, getting and giving feedback, making changes, and collaborating with their creative partners (and there are always creative partners) and, eventually, their audience. This set of things is not served by seeing how others before you have solved the problems that the work presents. It is actually more educational and helpful to see that work AFTER you have done your own, so that you can see what you DIDN’T see before. So, as you can see, I actually trust myself and my students much more than I would if I had them study the work of those who scored the exact same film before they did. Furthermore, this is not what silent film score needs. A silent film needs music to connect it to the audience – the film itself is literally incomplete without it. But, to keep the film alive as a film experience, and not just as a historical curiosity, the film needs new scores – scores that present the emotional core of the story in the way that a score always does, which is to capture and express the emotional response of the composer to the story itself. This is what all parts of the filmmaking process are about, from acting to shooting to editing – all the creators are putting forth their (trained, developed, practiced, but honest) responses in the hope of moving an audience with the story. Anyone who does this knows that this is what the process is. The beauty of silent film is that a century old story can actually come alive again by speaking in the voice of this present time, to an audience that is experiencing it now. That is the thing that makes a new score – or any new piece of work – valuable, and that is what we hope to do with the BSFO.